Baggage Capacity 286 cu. ft.
One of our most popular private jet charters, the Embraer Legacy 650, is a heavy jet with long range capabilities. 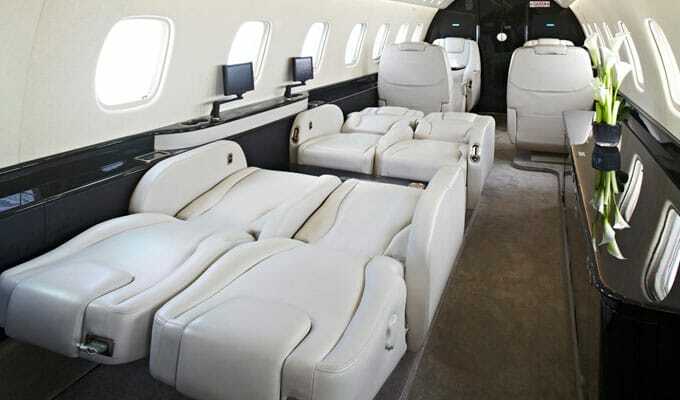 This leading choice for your corporate jet charter seats 13 passengers in typical configuration but can be reconfigured to seat up to 19 passengers comfortably. In the cabin, the stand-up height is an ample 6 feet, and your bags are in hand with a fully accessible compartment. This business jet charter has a range of 4,237 nm and can fly nonstop from London to New York. As our premier private jet charter, the Legacy 650 has a spacious and fully equipped galley with a touch screen monitor for master control of cabin systems. The corporate jet charter has a full-width lavatory with ample closet space, so you can be sure that your passengers are comfortable. Embraer introduced the Legacy 650 in 2009, with flight certifications following in Europe and the United States in 2010. The list price for a new Embraer Legacy 650 in 2016 is $43.15 million. 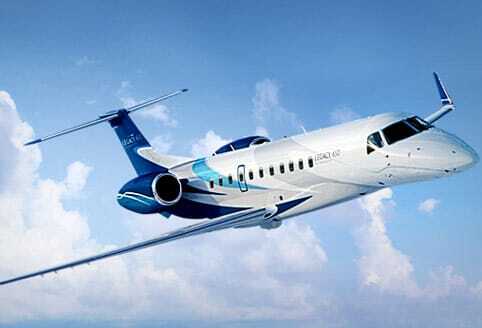 The Embraer Legacy boasts an airspeed of 528 miles per hour and a baggage capacity of 286 cubic feet. This Legacy has all the comforts you expect from a heavy class corporate charter. With plenty of space and the range to cross oceans or states. Whether you are interested in a business jet charter for your company meeting with an important client or a private jet charter for a luxury vacation, JetOptions can help pair you with the perfect large and super large aircraft. We are a premier private jet charter company that offers the best corporate jet charters and unbeatable personal service. Our unique business model allows us to provide flexible, point-to-point prices and access to some of the most luxurious private jet charters in the world. We are a leading provider of an on-demand private jet charter service, so contact our experienced team for all your business jet charter needs.